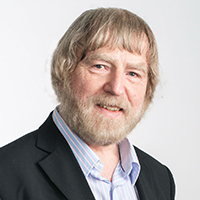 Peter Bishop is a Professor at the Centre for Software Reliability, sharing a joint chair in Systems and Software Dependability with Robin Bloomfield. He is also a Principal Consultant at Adelard which provides computer safety and dependability consultancy and research services to industry. He has BSc and MSc degrees in Physics and is a Chartered Engineer and Member of the IEE. Peter Bishop joined City University in 2001, and his research work includes participation in the DISPO2 project, and research on design diversity and software reliability prediction as part of the DIRC project. At Adelard he is involved in safety critical systems research and consultancy. He was the Adelard team leader in the SHIP international research project on the assessment of hazardous industrial processes. He is also the primary researcher on the QUARC projects funded by the UK nuclear industry These projects are concerned with the quantification of the reliability in computer-based systems. He was formerly employed in the research laboratories of the CEGB and National Power. Initially he was involved in the development of process automation systems including the development of the CEGB standard distributed process-control system (CUTLASS), which is used in the majority of electrical power plants in England and Wales. In later years his work was primarily concerned with software reliability research and assessment. He was heavily involved in the assessment of the Sizewell B Primary Protection System software and also undertook research into formal specification methods, verification and testing, software diversity and fault tolerance. Most of this research was performed in international collaborations with UK and European partners. Three projects were undertaken as part of the OECD Halden Reactor Project research programme and one project (DARTS) was undertaken under the ESPRIT programme. Bishop, P.G. (1990). Dependability of Critical Computers Systems 3: Techniques Directory. Elsevier Apllied Science. ISBN 1-85166-544-7. Bishop, P.G. (1995). Software Fault Tolerance by Design Diversity", Software Fault Tolerance, (Lyu, M., Eds. ), Wiley, USA, Springer, ISBN 0-471-95068-8, 1995. Software Fault Tolerance (pp. 211–229). Wiley. ISBN 0-471-95068-8. Bishop, P.G., Bloomfiel, R.E. and Cyra, L. (2013). Combining Testing and Proof to Gain High Assurance in Software: a Case Study. (ISSRE 2013) IEEE International Symposium on Software Reliability Engineering 4-7 November, Pasadena, CA, USA. Bishop, P.G. (1997). Using reversible computing to achieve fail-safety. van der Meulen, M.J.P., Bishop, P.G. and Revilla, M. An Exploration of Software Faults and Failure Behaviour in a Large Population of Programs. 15th International Symposium on Software Reliability Engineering. Bishop, P. and Povyakalo, A. (2017). Deriving a frequentist conservative confidence bound for probability of failure per demand for systems with different operational and test profiles. Reliability Engineering & System Safety, 158, pp. 246–253. doi:10.1016/j.ress.2016.08.019 . Bishop, P., Bloomfield, R., Littlewood, B., Popov, P., Povyakalo, A. and Strigini, L. (2014). A conservative bound for the probability of failure of a 1-out-of-2 protection system with one hardware-only and one software-based protection train. Reliability Engineering & System Safety, 130, pp. 61–68. doi:10.1016/j.ress.2014.04.002 . Littlewood, B., Bishop, P., Bloomfield, R., Povyakalo, A. and Wright, D. (2011). Towards a formalism for conservative claims about the dependability of software-based systems. IEEE Transactions on Software Engineering. doi:10.1109/TSE.2010.67 . Bishop, P. and Bloomfield, R. (1996). A conservative theory for long-term reliability-growth prediction. IEEE TRANSACTIONS ON RELIABILITY, 45(4), pp. 550–560. doi:10.1109/24.556578 . Bishop, P.G. (1993). The Variation of Software Survival Time for Different Operational Input Profiles. FTCS pp. 98–107. BISHOP, P.G., ESP, D.G., BARNES, M., HUMPHREYS, P., DAHLL, G. and LAHTI, J. (1986). PODS - A PROJECT ON DIVERSE SOFTWARE. IEEE TRANSACTIONS ON SOFTWARE ENGINEERING, 12(9), pp. 929–940. doi:10.1109/TSE.1986.6313048 . Bishop, P., Bloomfield, R., Guerra, S. and Thuy, N. (2012). Safety justification frameworks: Integrating rule-based, goal-based and risk-informed approaches. 8th International Topical Meeting on Nuclear Plant Instrumentation, Control, and Human-Machine Interface Technologies 2012, NPIC and HMIT 2012: Enabling the Future of Nuclear Energy (pp. 1283–1290). ISBN 978-1-62748-015-4. Bloomfield, R.E., Bendele, M.M., Bishop, P.G., Stroud, R.J. and Tonks, S. (2016). The risk assessment of ERTMS-based railway systems from a cyber security perspective: Methodology and lessons learned. Reliability, Safety and Security of Railway Systems (RSSRail 2016) 28-30 June, Paris. Bishop, P. (2015). Modeling the impact of testing on diverse programs. Bishop, P.G. and Strigini, L.S. (2014). Estimating Worst Case Failure Dependency with Partial Knowledge of the Difficulty Function. 33rd International Conference, SAFECOMP 2014 10-12 September, Florence, Italy. Bishop, P. and Strigini, L. (2014). Estimating worst case failure dependency with partial knowledge of the difficulty function. Bishop, P.G. (2013). Does software have to be ultra reliable in safety critical systems? SAFECOMP 2013, 32nd International Conference on Computer Safety, Reliability and Security 24-17 September, Toulouse, France. Bishop, P.G. and Cyra, L. (2012). Overcoming Non-determinism in Testing Smart Devices: How to Build Models of Device Behaviour. 11th International Probabilistic Safety Assessment and Management Conference and the Annual European Safety and Reliability Conference 2012 (PSAM11 ESREL 2012) 25-29 June, Helsinki, Finland. security: a study with AntiVirus engines. Stankovic, V., Bloomfield, R., Bishop, P. and Gashi, I. (2011). Diversity for Security: a Study with Off-The-Shelf AntiVirus Engines. 21st International Symposium on Software Reliability Engineering (ISSRE 2011) Hiroshima, Japan. Bishop, P., Tourlas, K. and Chozos, N. (2010). An Approach to Using Non Safety-Assured Programmable Components in Modest Integrity Systems. Bloomfield, R. and Bishop, P. (2010). Safety and Assurance Cases: Past, Present and Possible Future - an Adelard Perspective. Bishop, P., Gashi, I., Littlewood, B. and Wright, D. (2007). Reliability modeling of a 1-out-of-2 system: Research with diverse Off-the-shelf SQL database servers. Bishop, P.G. (2005). SILS and Software. UK Safety Critical Systems Newsletter. Bishop, P.G. (2004). Estimating PLC logic program reliability. Bentley, J.G.W., Bishop, P.G. and van der Meulen, M. (2004). An empirical exploration of the difficulty function. Littlewood, B., Bloomfield, R., Popov, P., Povyakalo, A. and Strigini, L. (2004). The impact of ‘difficulty’ variation on the probability of coincident failure of diverse systems. International Conference on Control and Instrumentation in Nuclear Installations Liverpool. Bishop, P.G. and Bloomfield, R.E. (2003). Using a Log-normal Failure Rate Distribution for Worst Case Bound Reliability Prediction. 14th IEEE International Symposium on Software Reliability Engineering (ISSRE 2003) 17-20 November, Denver, Colorado. Bishop, P.G. (2003). MC/DC based estimation and detection of residual faults in PLC logic networks. 14th IEEE International Symposium on Software Reliability Engineering ISSRE 2003 17-20 November, Denver, Colorado. Bishop, P., Bloomfield, R., Clement, T., Guerra, S. and Jones, C. (2003). Integrity static analysis of COTS/SOUP. Bishop, P., Bloomfield, R., Clement, T. and Guerra, S. (2003). Software criticality analysis of COTS/SOUP. Bishop, P.G. and Bloomfield, R.E. (2002). Worst Case Reliability Prediction Based on a Prior Estimate of Residual Defects. Thirteenth International Symposium on Software Reliability Engineering (ISSRE '02) 12-15 November, Annapolis, Maryland. Bishop, P.G. (2002). Estimating Residual Faults from Code Coverage. SAFECOMP 2002 10-13 September, Catania, Italy. Bishop, P.G., Bloomfield, R.E., Clement, T. and Guerra, S. (2002). Software Criticality Analysis of COTS/SOUP. Bishop, P.G., Penny, J., Eaton, A. and Bloomfield, R. (2001). The Practicalities of Goal-Based Safety Regulation. Ninth Safety-Critical Systems Symposium 6-8 February, Bristol, UK. Bishop, P.G. and Bloomfield, R.E. (1998). A Methodology for Safety Case Development. Safety-critical Systems Symposium 98 February, Birmingham, UK. Bishop, P.G. and Bloomfield, R.E. (1995). The SHIP Safety Case - A Combination of System and Software Methods. 14th IFAC Conf. on Computer Safety, Reliability and Security (SafeComp95) 11-13 October, Belgirate, Italy. Bishop, P.G. and Bloomfield, R.E. (1995). The SHIP Safety Case. SafeComp 95, Proc. 14th IFAC Conf. on Computer Safety, Reliability and Security 11-13 October, Belgirate, Italy,. Bishop, P.G., Burns, G. and Anderson, S.O. (1993). Stepwise Development and Verification of a Boiler System Specification. International Workshop on the Design and Review of Software Controlled Safety-related Systems 28-29 June, National Research Council, Ottawa, Canada. Bishop, P.G. and Pullen, F.D. (1991). A Random Walk through Software Reliability Theory. Mathematical Structures for Software Engineering. Bishop, P.G. and Pullen, F.D. (1989). Failure Masking - A Source of Dependency in Multi-Version Programming. Int. Working Conference on Dependable Computing Applications August, Santa Barbara, USA. Bishop, P.G. and Pullen, F.D. (1988). Probabilistic Modelling of Software Failure Characteristics. SAFECOMP 88 November, Fulda, Germany. Bishop, P.G. and Pullen, F.D. (1988). PODS Revisited - A Study of Software Failure Behaviour. Eighteenth Fault Tolerant Computing Symposium (FTCS-18) June, Tokyo. Bishop, P.G. and et al, (1987). STEM: a Project on Software Test and Evaluation Methods. Safety and Reliability Society Symposium 1987 (SARS 87) Altrincham, Manchester. Bishop, P.G. (1987). The PODS Diversity Experiment. Dependable Computing and Fault Tolerant Systems. Bishop, P.G. and Bloomfield, R.E. A conservative theory for long term reliability growth prediction. ISSRE '96: 7th International Symposium on Software Reliability Engineering. Bloomfield, R., Bishop, P., Butler, E. and Stroud, R. (2018). Security-Informed Safety: Supporting Stakeholders with Codes of Practice. Computer, 51(8), pp. 60–65. doi:10.1109/MC.2018.3191260 . Bloomfield, R., Bishop, P., Butler, E. and Netkachova, K. (2017). Using an assurance case framework to develop security strategy and policies. Lecture Notes in Computer Science (including subseries Lecture Notes in Artificial Intelligence and Lecture Notes in Bioinformatics), 10489 LNCS, pp. 27–28. doi:10.1007/978-3-319-66284-8_3 . Guerra, S., Bishop, P., Bloomfield, R. and Sheridan, D. (2010). Assessment and qualification of smart sensors. 7th International Topical Meeting on Nuclear Plant Instrumentation, Control, and Human-Machine Interface Technologies 2010, NPIC and HMIT 2010, 1, pp. 499–510. Bishop, P. and Cyra, L. (2010). Overcoming Non-determinism in Testing Smart Devices: A Case Study. pp. 237–250. doi:10.1007/978-3-642-15651-9_18 . Bishop, P., Bloomfield, R., Guerra, S. and Tourlas, K. (2005). Justification of smart sensors for nuclear applications. Lecture Notes in Computer Science (including subseries Lecture Notes in Artificial Intelligence and Lecture Notes in Bioinformatics), 3688 LNCS, pp. 194–207. doi:10.1007/11563228_15 . Bishop, P.G., Bloomfield, R.E., Emmet, L.O., Johnson, C., Black, W., Hamilton, V. … Koorneef, F. (2003). Learning from incidents involving E/E/PE systems, Part 1: Review of methods and industry practice. http://www.hse.gov.uk/research/rrhtm/rr179.htm. ISBN 0-7176-2787-X. Bishop, P.G., Emmet, L.O., Johnson, C. and Black, W. (2003). Learning from incidents involving E/E/PE systems, Part 2: Recommended scheme. http://www.hse.gov.uk/research/rrhtm/rr181.htm. ISBN 0-7176-2789-6. Bishop, P.G., Emmet, L.O., Johnson, C. and Black, W. (2003). Learning from incidents involving E/E/PE systems, Part 3: Guidance examples and rationale. http://www.hse.gov.uk/research/rrhtm/rr182.htm. ISBN 0-7176-2790-X. Bishop, P.G., Jones, C.C.M., Bloomfield, R.E. and Froome, P.K.D. (2001). Methods for assessing the safety integrity of safety-related software of uncertain pedigree (SOUP).. ISBN 0-7176-2011-5. Bishop, P.G., Bloomfield, R.E. and Froome, P.K.D. Justifying the use of software of uncertain pedigree (SOUP) in safety-related applications. May 2001. ISBN 0-7176-2010-7. Member of the College of Reviewers for the Canada Research Chairs Program. There are two types of Chairs: Tier 1 Chairs (seven year term, renewable indefinitely, $200K per annum) are offered to outstanding researchers recognized as world leaders in their field; Tier 2 Chairs (five year term, renewable once, $100K per annum) are offered to exceptional emerging researchers. For more information, please visit our Web site at www.chairs-chaires.gc.ca.